This tour starts at Paro (west) and ends at Samdrup Jongkhar (South east). It cover 3 regions of Bhutan; the west, central and east. Those who are undergoing this tour have to enter via Paro international airport and exit via Guwahati (Indian state). In the morning ride till Taktsang base from where the 6 hour round trip hiking to Taktsang monastery begins. Punakha Dzong: The dzong is situated on a stretch of a land where two rivers – Phochu and Mochu – meet. The dzong was built by Zhabdrung Ngawang Namgyal in the year in 1937 and named it Pungthang Dewa Chenpai Phodrang, the palace of great bliss. Later it became the final retreat palace for him. The first monarch, King Ugyen Wangchuck, was crowned there and it served as the capital of the country until 1955. Today it serves as the winter residence of the Central Monastic Body. The sacred relic Rangjung Kharsapani is also kept in the Machen Temple inside the dzong. At an altitude of 3000 m above sea level, under Wangduephodrang district of western Bhutan, Gangtey valley is one amongst the most beautiful glacial valley in Bhutan. It is located 200 km east of Paro International Airport. Today we will dedicate our day for exploring around Gangtey valley. We will go for short hike around the valley, mingle with local farmers and know about their daily lives. Towards afternoon, pay visit to Gangtey Goemba (monastery), the seat of Gangtey truelku, to whom the linage of Bhutan’s ruling monarch, the Wangchuck dynasty is linked. Overnight: At hotel in Gangtey. Today is a long day ride to Trongsa from Gangtey valley. Our journey begins by riding uphill towards Pelela Pass (3430 m). This pass has served as traditional demarcation between eastern and western Bhutan. The road then descends down gradually towards Chendebji valley, remains constant for a while and finally ascends towards Trongsa. After long and tiring day we will stop over at Trongsa for the night. Day 7 starts with an uphill riding from Trongsa towards Yotongla (3430 m). 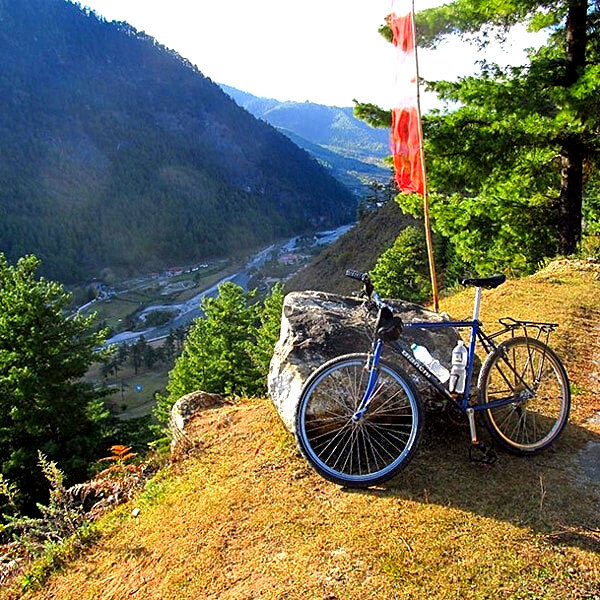 It is a grueling 29 km uphill riding before it descends down towards Nangar. From Nangar it is again an uphill riding till Kiki la (2870 m). From here the road then finally descends down towards Bumthang Chamkhar town (2610 m). Check into your hotel and call it a day. 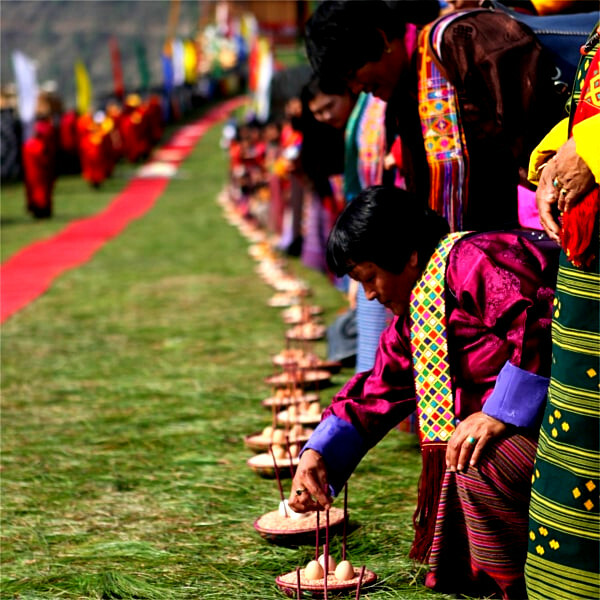 Bumthang, known as cultural heartland of Bhutan has been blessed by visits of many Buddhist saints from neighboring states of Tibet, India and Nepal. Bumthang have scores of sacred places and monasteries which are linked to Buddhist culture and traditions of Bhutan. Kurje Lhakhang: Located in Kurje in the Chokhor valley, around 15 minutes’ drive from Chamkhar town (Bumthang), the site of the three temples has a body impression of Guru Rinpoche left behind after he meditated there and subdued evil spirits the chief of which was Shelging Karpo. Kurje means body impression. Guru Rinpoche visit Bumthang in 746 AD at the invitation of the local king, Chakhar Gyalpo. The oldest temple was built in 1652 by Chogyal Migyur Tenpa, the first Choetse Chila. The second temple was built in 1900 by the first King Gongsa Ugyen Wangchuck on the spot where Guru left his body imprint, and the third temple was built in the 1990s under the commanded of Queen Mother Ashi Kesang Choeden Wangchuck. The first, second, and the third temple contain respectively the three Buddha (the past, present and future), a 12-metre tall statue of Guru Rinpoche, and Khenlop Chosum (Guru Rinpoche, King Thrisong Duetsen, and Pandit Santarakshita). Jakar Dzong: Located on a ridge above Chamkhar valley, Jakar Dzong, formally called Jakar Yugyal Dzong, was founded by Lam Ngagi Wangchuk (Buddhist priest) in 1549. Lam Ngagi Wangchuk was believed to have seen a white bird land at the spot where he built a small temple and started a monastic body. Later, when Desi Chogyal Migyur Tenpa (secular head of Bhutan, 1667-1680) expanded the temple into a Dzong in 1646, it came to be known as Jakar (Bya dkar) Dzong (White Bird Dzong). The Dzong houses many temples and it is today the seat of district administration and monastic body. Jampay Lhakhang: Located in Chokhor Gewog in Bumthang, 10 minutes’ drive from Chamkhar town; Jampay Lhakhang is believed to be one of the two temples (the other is Kyichu Lhakhang in Paro) built by Tibetan King Songtsen Gampo in the 7th century AD in Bhutan among 108 temples that he built in one day to subdue a demoness that lay supine across the Himalayas. It’s believed to have been built on the left knee of the demoness. Besides the future Buddha, Jowo Jampa (Maitreya) from which the temple derives its name, the temple contains more than 100 statues of the gods of Kalachakra built by the first King of Bhutan in 1887. Tamzhing Lhakhang: Located in Tamzhing, some 20 minutes’ drive from Chamkhar town, it was built in 1505 by Terton Pema Lingpa; the temple served as his main seat. The relics contained in the statues in the temple are treasures discovered by the terton (treasure discoverer) himself. The two-storey temple houses the images of Peling Tsokhor Sum (three principal deities of Peling tradition), the three Buddhas (Duesum Sangay), Guru Tshengyed (eight manifestations of Guru Rinpoche), and a life-size statue of Terton Pema Lingpa. Among many relics crafted by the founder himself are the hat of Guru Statue and metal chain armour. Mongar is located 198 km east of Bumthang. Due to long distance, it will not be possible to complete the entire journey by cycling unless you are an experienced rider. For those who cannot complete the entire journey by cycle can use the service of tour vehicle. We start our journey by ascending slowly, crossing Ura village. 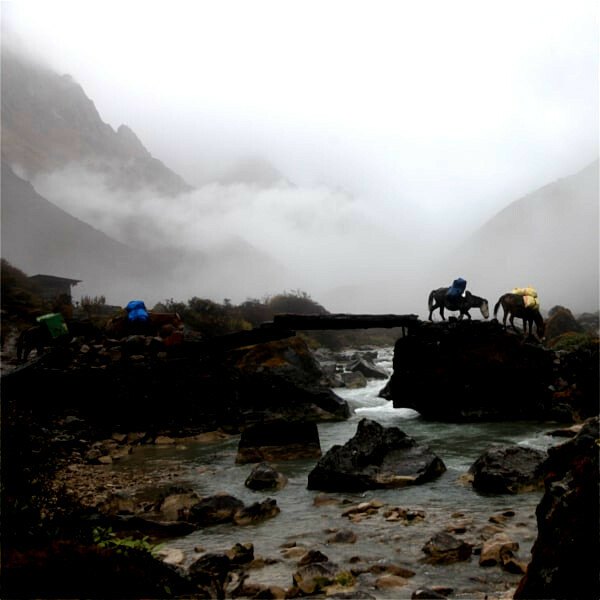 From Ura it is a difficult uphill riding till Thrimshingla pass located 3800 m above sea level. The road then descends down via beautiful Sengor village to Lingmithang of as low as 650 m above sea level and then finally ascends towards Mongar (1600m). After breakfast, start your journey eastward towards Trashigang. In the morning stroll around Mongar town and start cycling uphill towards Korila pass (2400 m). From here it is fairly an easy downhill ride till Sheri Chhu (River) Bridge. We will follow Drangme Chhu River bank and ascend slowly upward till we reach Trashigang town. It is another long day ride. Samdrupjongkhar is a border town located 180 km south of Trashigang. We begin our journey riding uphill towards Yonphula pass, crossing Sherubtse College, the oldest in Bhutan. This college was founded in the year 1966 by a group of Jesuits under the leadership of father William Mackey. The road from Yonphula then descends gradually until we reach Samdrupjongkhar. Your cycling journey comes to an end today. Overnight: At hotel in Samdrupjongkhar. After breakfast, your guide and driver will drop you off at Bus stand located next to Bhutan gate (within India). Buses from here depart to Guwahati, the nearest international airport. Guwahati is located 100 km south of Samdrupjongkhar.